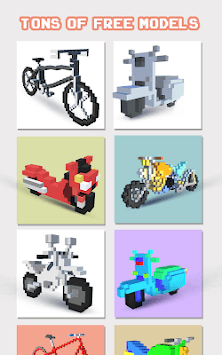 Bikes 3D coloring is an excellent way to pass time with creating your artworks! Have you ever imagine turning bikes coloring pages into 3D and color in a brand new angle?Now we offers you the 3D coloring experience, more vivid and interesting!Color by numbers as known as pixel coloring is the new trend, but what makes it unique is that you can paint bikes in 3D with the help of numbers. This is the greatest opportunity for the youngest ones to express their creativity regarding the sensational scooters.They love them so much as they are the most convenient for the city ride and they have proven as the fastest vehicle when the traffic is heavy. Every rider will like to paint a bike by his own way.It doesn't require any drawing skills while painting, just paint with the help of numbers.Choose from the variety of 3D templates, just follow the numbers and fill in the colors.Rotate the screen to color in different dimensions.Coloring is a stress-relief therapy and 3D coloring will give you more sense of achievements.Many grown-ups do number coloring to anti stress, since voxel 3D number coloring book is like a pixel art therapy.But do you know coloring apps in 3D will give you much more sense of achievements.You will get addictive to paint by numbers in 3D,especially with all the graphics which we work really hard on them.Take your time, relax and enjoy coloring! - First of all choose bikes you want to paint. - When you zoom in,you will see that there are alot of small boxes with numbers inside which indicates that you will fill these numbers by the boxes given below with colors. - Just paint by numbers in this interesting sandbox 3d game. - Simply tap to pick color and paint in all direction by moving picture and all you need is your imagination. - Finish a fantastic pixel artwork. - Good for development and relaxed creativity. - Paint easily any image. - Coloring anti-stress pictures suits for family. - Beautiful motorcycle and super-bike pixel art. - Coloring By Number is an amazing way to improve drawing skill as well as color therapy. 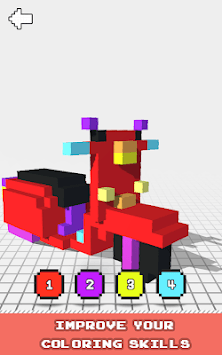 - Many interesting 3D motorcycles for you to color. 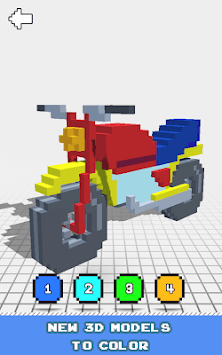 Lots of pictures and fascinating patterns will help you to relieve stress,develop color matching skills and bring out your racing artist.Spread your creativity with cool moto, minibike, trial moto, motorbike, tourer, chopper, dragster, roadster, enduro, water bike and sportbikes. Hopefully these bikes can realize yourself a unique and exciting motorcycle color artist.